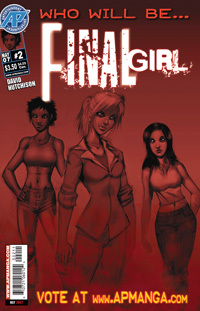 Who will be the Final Girl? The choice is yours! YOU, the reader, will vote to determine who lives and who DIES! The most intense comic experience of 2007 continues with unrelenting horror! In the blood-drenched wake of issue 1, the surviving students find themselves trapped within the terror-stained walls of the town’s iron factory. There they encounter a mysterious survivor who may know the secret of escaping the town, but the horrific maniacs who populate the place are closing in on them. Can Naomi, Heather, Ashley and the rest of group sacrifice one of their own in order to survive? And who or what is the being known as "The Skinner"? From the disturbed mind of David Hutchison (Oz: The Manga, Beowulf) comes this all-new series set in a world of unimaginable horror! To vote, go to the Final Girl Poll page and pick your favorite!